David McVicar’s production of Die Zauberflöte embraces both the seriousness and the comedy of Mozart’s opera, and takes the audience into a beautiful dreamlike world, where dancers turn into magical animals at the sound of Tamino’s flute, three boys arrive by flying machine and a rising golden sun hails a new dawn in the opera’s celebratory final chorus. The score of Die Zauberflöte is extremely varied. The folksong-like arias of the robust ‘man of nature’ Papageno contrast with the coloratura fireworks of the Queen of the Night. Much of the music for the priests, and the duet of the Men in Armour, have a stately Baroque simplicity. There are exquisite lyrical solos for Pamina and Tamino. Extended passages – such as the finales to both acts, in which there is no spoken dialogue – look forward to German Romantic opera. Mozart was an enthusiastic member of the Freemasons and many critics have seen Die Zauberflöte as being in part a Masonic allegory. The use of numbers in the score – particularly the number three – has been linked to Masonic rites, and it is possible that the wise Sarastro may have been modelled on Ignaz von Born, a scientist and prominent Viennese Freemason. Mozart wrote Die Zauberflöte for the Theater auf der Wieden, a suburban theatre in Vienna run by the larger-than-life actor and impresario Emanuel Schikaneder. As well as writing the libretto, Schikaneder was the first Papageno in the opera. At its premiere, Die Zauberflöte was acclaimed by the general public and by connoisseurs, including Mozart’s supposed rival Salieri, who adored it. 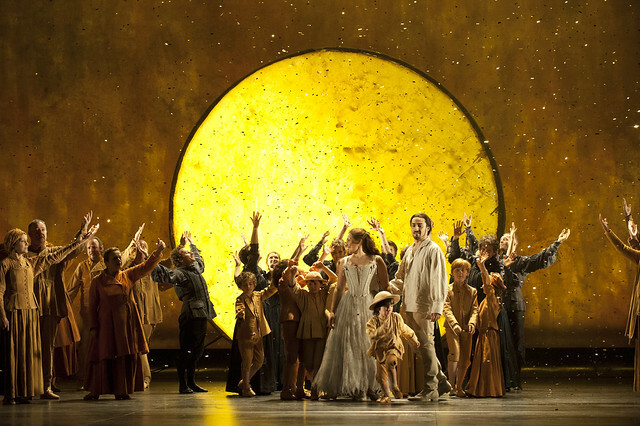 Die Zauberflöte has been performed more than 300 times at the Royal Opera House. Die Zauberflöte runs 12 September–14 October 2017. Tickets are still available. Having seen this production once this article makes you want to see it again and again. As Sir Colin Davis says, "it needs to live"
What a wonderful event and article, greetings from Chile, Southamerica. Have just been to the dress rehearsal of this wonderful opera, and am on cloud 9. It was fantastic, wonderful singing and staging, and the bass was the best I have ever heard, magnificent rich voice even in the lowest range. Have just been to the final dress rehearsal of Die Zauberflöte and as much as I would like to agree with the previous comments, I am really sorry I cannot. This version of Mozart's Magic Flute by David McVicar lacked theatrical effectiveness, enticement and flare. These problems were compounded by the slow tempo. I bought the ticket just 2 hours before the show cause I did not get the cheaper ticket before. This was my first time to watch the live Magic Flute, so excited!!!! The Queen was amazing! I love her voice!!! Already bought more tickets for the later operas. I am very looking forward to them! Bravo!